Chase was born into a family of divers. Now at age 25, he has a decade’s worth of diving under his belt and has found his way to Grand Cayman. An award-winning underwater/surf photographer, videographer and filmmaker, Chase has a deep passion for capturing the natural beauty of aquatic environments and a skill for masterfully depicting these fragile environments on earth that steal people's hearts. Being surrounded by some of the clearest water in the Caribbean makes it easy to grab a camera and find somewhere new to explore every day. "I cannot help but have this feeling deep in my soul that something amazing, something rare, or something life changing might happen at any given moment in front of my lens." Alan is originally from Newcastle in Northern England, where he started his diving in freezing quarries. After getting a degree in marine biology, he ran research stations in Andros Island, Bahamas, in Gau Island, Fiji and Mafia Island, Tanzania. At those research stations, he conducted studies on manta rays, whale sharks, grouper feeding strategies and coral and mangrove habitat conservation, along with teaching college students how to conduct marine surveys. After finding the crystal clear waters and the easy-going lifestyle of Cayman, he got married and has called the island home for the last 10 years. Alan has developed extensive knowledge of the Cayman waters and marine life and is always happy to share that with other divers and snorkelers, along with recommending the best places for your dives. Where is Ollie from? Having been born in England and lived most of his life elsewhere, you might confuse him for an Australian. But after falling in love with Grand Cayman, he has put down his roots here. 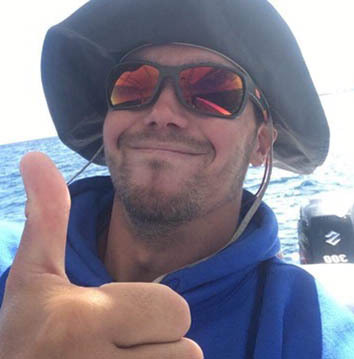 Ollie has been a diver since his late teens, taking his first dive while traveling in Southeast Asia and eventually finishing his professional qualifications in the Cayman Islands. His passion for marine life and drive to learn more about animal interactions led him to complete an M.Sc. in Marine Ecology. Later, he went on to research sharks in the Cayman Islands. Discuss the interesting things he's learned while he takes you on a dive! Corey was born in the land of 10,000 lakes, also known as Minnesota. She spent her summers playing soccer, rugby, running track, and boating up north. To escape the winters, she and her family would vacation right here in Cayman! She graduated college from Madison, Wisconsin with two bachelor’s degrees. One in Environmental Science and the other in Physical Geography; then, she moved down to Cayman full-time. Her favorite dive site is Dragon’s Lair, East End. Corey is one of our photographers at Cayman Turtle Divers and loves to capture the underwater beauty and life at every dive site. She has seen this island change so much both above water and below! JT is a born and raised Texan whose first dive was in a lake. The pursuit of a better and more exciting dive experience landed him in Grand Cayman (where he completed all of this instructor training), and he has never looked back! Previously a mechanic, JT has a love of fast cars and fast boats. As a boat captain, two of his greatest passions are taking the wheel and hunting the colorful lionfish found in the Grand Cayman waters. His favorite dive sites, Ghost Mountain and Big Tunnels, feature dramatic drop-offs that speak to his adventurous spirit. Lukas is a 27-year-old scuba junkie who is one part Chilean and one part German. Born and raised in Chile, his proximity to the ocean allowed him to behold all its amazing creatures and wonders. Lukas received his M.Sc. in Civil Engineering in Germany and then promptly told his family he was going to travel and dive around the world. After diving all over Asia, South America, Europe and the Caribbean, life brought him to the pretty beaches and wonderful island life of the Caymans. Lukas looks forward to diving with everyone that shares his passion! West Philadelphia born and raised, on the playground is where she spent most of her days... until her eyes were opened to the magical world of scuba diving. Liz graduated from Coastal Carolina University with a Bachelor’s degree in Marine Science. 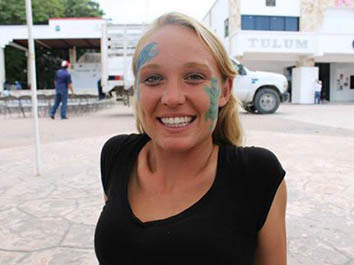 There, she was fortunate enough to intern with Bimini Biological Field Station and help with tagging/researching sharks. She started focusing on coral conservation, teaching people how to monitor the health of the coral reef in the marine reserve of Si’an Ka’an, Mexico. Here, her favorite reefs are Bonnie’s Arch, Little Tunnels, and Turtle Schooner, where you can always find her with her face in the corals looking for little critters. She loves seeing the excited faces of her guests and sharing her passion for our beautiful world under the sea. Ethan was born inland but has always had a love for the water. Originally from Vermont, he spent his summers lifeguarding at the local lake and swimming in rivers and quarries. Ethan joined the Navy to pursue travel and adventure. He then attended college in the Florida Keys where there was a diving program. After hearing the stories from fellow divers who had traveled the world as diving instructors, he knew this was the life he wanted to lead. 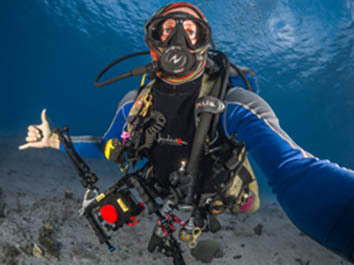 Before arriving in Grand Cayman, Ethan worked as a diver in the Bahamas and Hawaii. Besides scuba, Ethan likes to travel, hike, camp, surf, snowboard, kiteboard... and well, basically participate in any board sport. Contact us today and let's start planning your next aquatic adventure!